This minimalistic bag's elegant shape and natural canvas look great with any ensemble. On your search for the great small purse, think outside the boxy clutch or tote. This minimalistic bag pairs well with any ensemble, and allows the elegant shape and natural canvas to speak for itself. 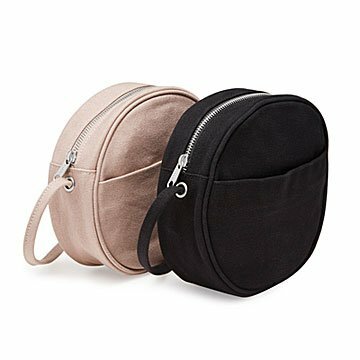 With just two pockets, you can separate essentials without having to dig through compartments and zippers just to find your lip balm or metro card. Finished with an adjustable cross body strap, it makes a lovely gift for friends with classic style. Choose from sleek black or natural canvas. Made in China.